During the debate Bill Nye presented many statements and asked many questions. Because of the nature of the event, Ken Ham was often unable to respond directly to many of these statements. 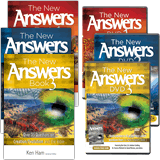 However, the majority of Nye’s statements and questions have been addressed on our website or by other organizations who teach a young-earth creation. As the video plays, this box will feature a sampling of articles, videos, books, and other resources to help you get answers. Or you can make a selection from the drop-down menu above to get answers about a topic of your choice. Note: several of these articles are technical in nature. Evolutionism—Is There Such a Word? A Young Earth—It’s Not the Issue! The Smithsonian/Sternberg Controversy: Cast Doubt on Darwin, Get Cast Out. What’s the Best “Proof” of Creation? Zonkeys, Ligers, and Wolphins, Oh My! Feedback: Evidence of New Genetic Information? What’s the Core Message of the Answers in Genesis Ministry? Feedback: Where Are All the Bunny Fossils? Why Don’t We Find Human and Dinosaur Fossils Together? Do Ice Cores Show Many Tens of Thousands of Years? Feedback: What Is Unique About the Colorado River? Feedback: What is the Most Compelling Scientific Evidence of a Young Earth? It’s an Ape… It’s a Human… It’s… It’s… a Missing Link! Church Leader "Aghast" at Belief in a Worldwide Flood? Do Creationists Believe in "Weird" Physics like Relativity, Quantum Mechanics, and String Theory? Did Tiktaalik’s Pelvis Prepare Fish to Walk on Land? Mr. Nye criticized the lack of undergraduate programs in nuclear medicine in Kentucky. The Joint Review Committee on Educational Programs in Nuclear Medicine Technology (JRCNMT) currently lists one accredited program in the state. How Did We Get the Bible in English? How Should We Interpret the Bible, Part 2: Is Genesis 1–11 Historical Narrative? Odd Saber-Toothed Beast Discovered—Preyed on . . . Plants? Discovery of new ideas, especially those that challenge prevailing opinion. Feedback: How Does Man’s History Fit with the Biblical Timeline? Evolution, the Election and the "Enlightened"
Do Evolutionists Throw Away Bad Ideas? Something fishy about gill slits! Peppered moths—back on the agenda? Can Creationists Be "Real" Scientists? Can an Evolutionist Celebrate Earth Day? Are They Teaching the Truth in Biology Class? Feedback: Does the Bible Prohibit Space Travel? Can Creation Models Be Wrong? Mount St. Helens—Evidence for Genesis! Chapter 23: Aren’t Millions of Years Required for Geological Processes? The “Principle of Least Astonishment”! Thoughts on the Goodness of Creation: In What Sense was Creation "Perfect"? Are There Gaps in the Genesis Genealogies? Secrets of the Universe: What happens when people look in the wrong place for signs of intelligence outside Earth? 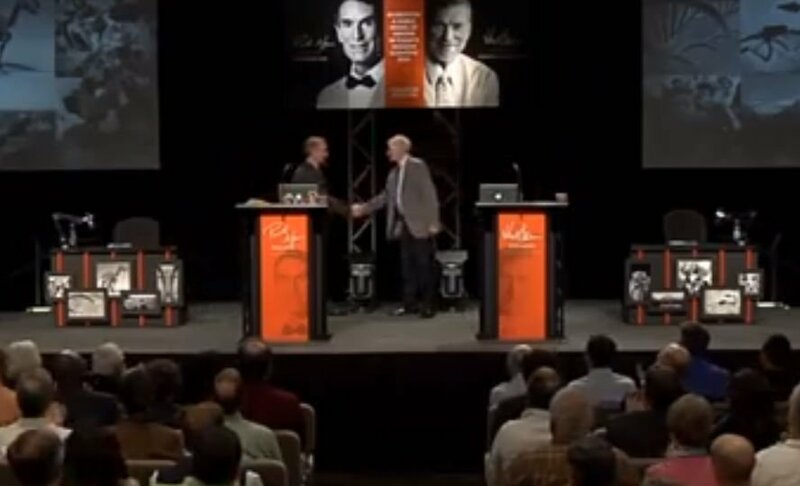 There were many defining moments in the historic debate between Bill Nye and Ken Ham at the Creation Museum in Northern Kentucky. 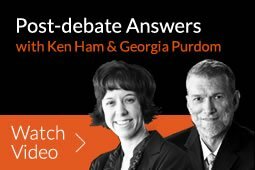 For Ken Ham, one of those defining moments came when Bill Nye twice referred to origins as a “great mystery.” Each time, Ken Ham responded by saying, “There is a book . . .” Of course that book is the Bible, God’s Word, which gives us answers to the skeptical questions of the age. Was there a defining moment that stood out to you during the debate? If not, it’s not too late! Your defining moment could be leading an outreach or just diving in to learn more so you can be ready to defend your faith. Your defining moment might even be receiving Jesus Christ as your Lord and Savior. Whatever that moment is for you, we would love for you to get connected with us and share your experience.